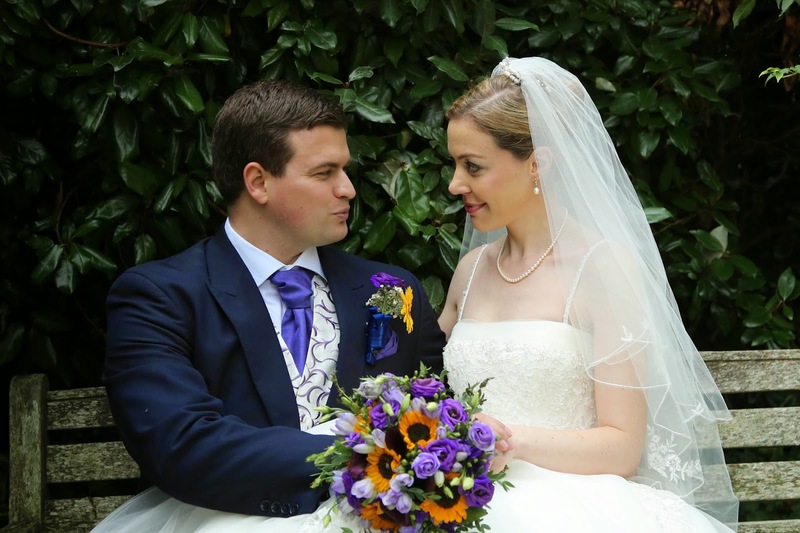 Leanne had a clear concept for her wedding flowers when we met and it was a pleasure to work with her to create such a beautiful wedding. She wanted a delicate colour palate and natural shape incorporating Sweet William (Dianthus Barbatus) as a homage to her new husband Will. 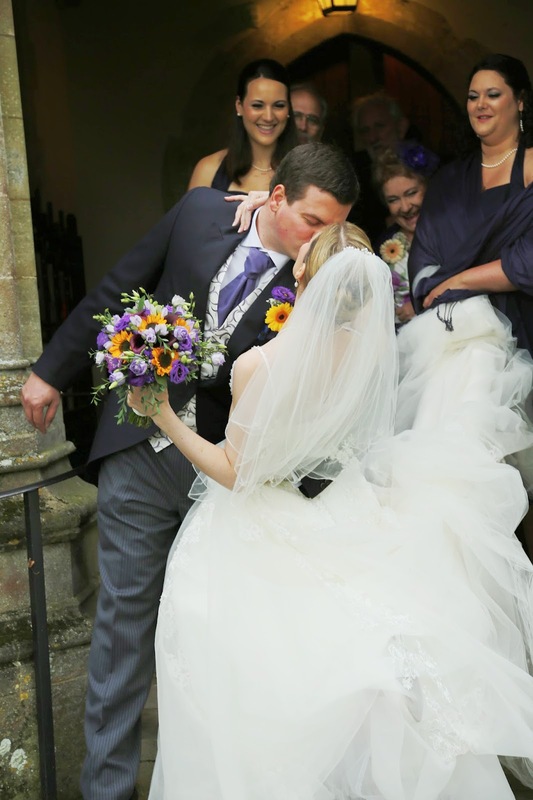 Her bridal bouquet included Peonies, Eucalyptus, Eryngium, Astilbe and Dianthus Barbatus wrapped with lace. 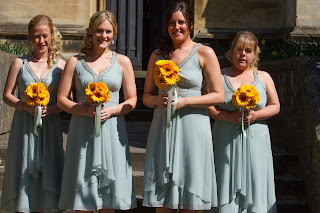 The bridemaids bouquets were a stunning mix of Peonies, Gypsohila and Eucalyptus bound with lace to complement their delicate grey dresses. 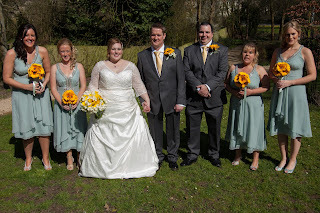 The buttonholes were made using Astilbe and Eryngium and the corsages white Chrysanthemums and Gypsophila. The Grooms buttonhole also included Dianthus Barbatus. 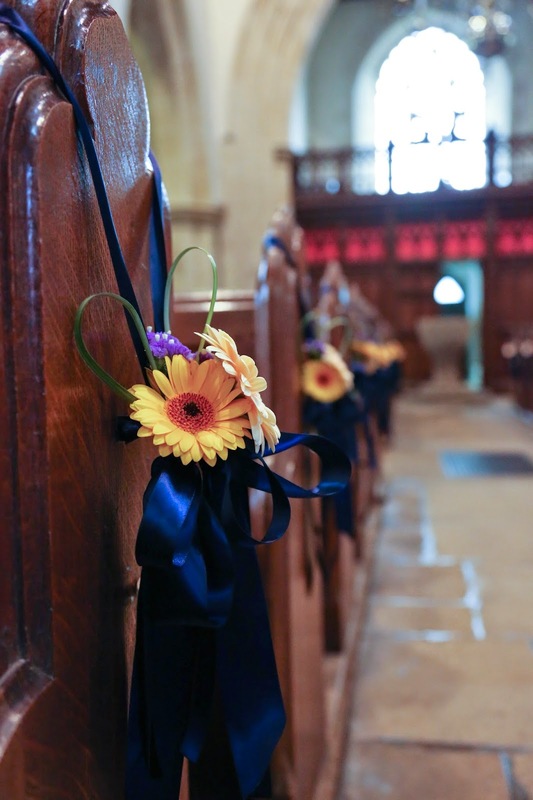 The pew ends were a simple arrangement of Freesia, Astilbe, Eryngium and Chrysanthemums. 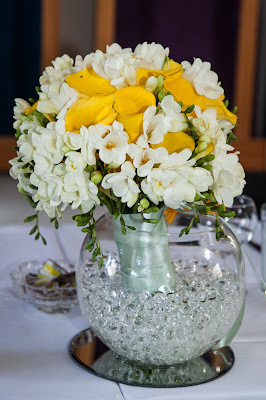 Leanne wanted a profusion of flowers for her centrepieces, arranged in an eclectic selection of jars with lace accents. 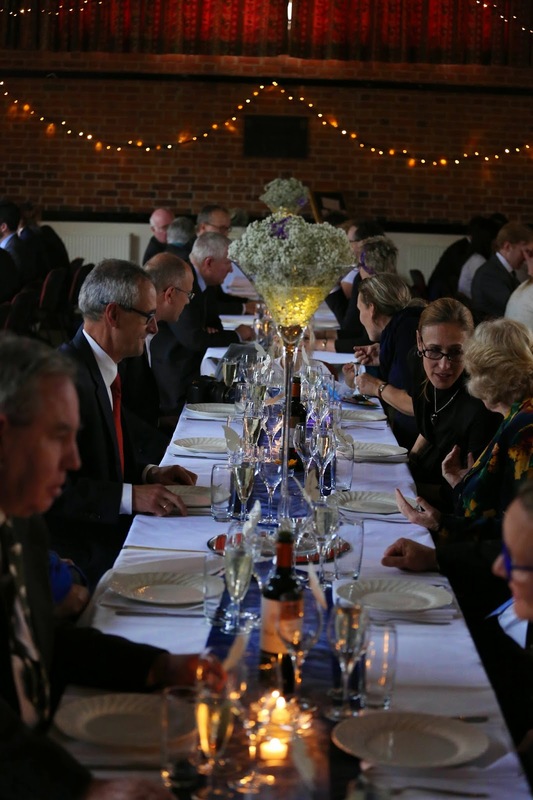 The jars were filled with arrangements of Agapanthus, Freesia, Astilbe, Eryngium, Chrysanthemums, Lavender, Peonies, Dianthus Barbatus, Asparagus Treefern and Eucalyptus. 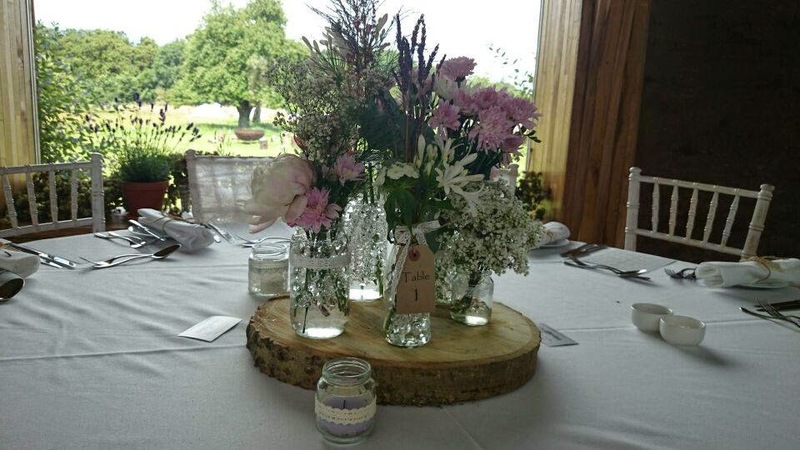 Set upon wood slices, cut and sanded by the groom, the centrepieces looked beautiful in this serene setting. 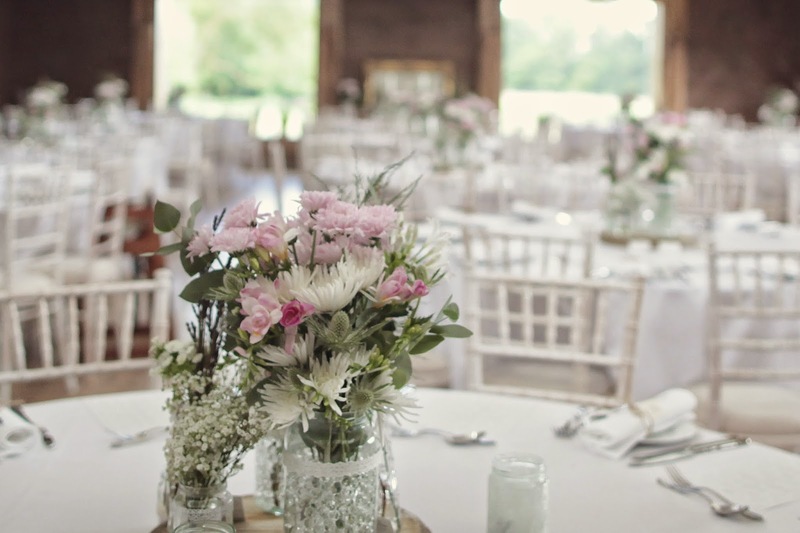 Smaller jars, containing Lavender scented candles, framed the centrepieces and enhanced their delicate fragrance. 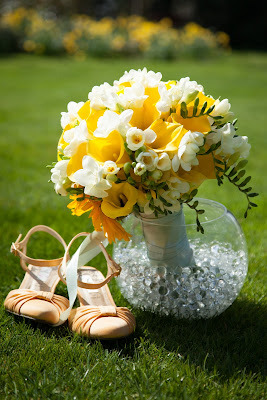 Melissa approached me because she wanted a completely non-floral wedding with keepsake bouquets. 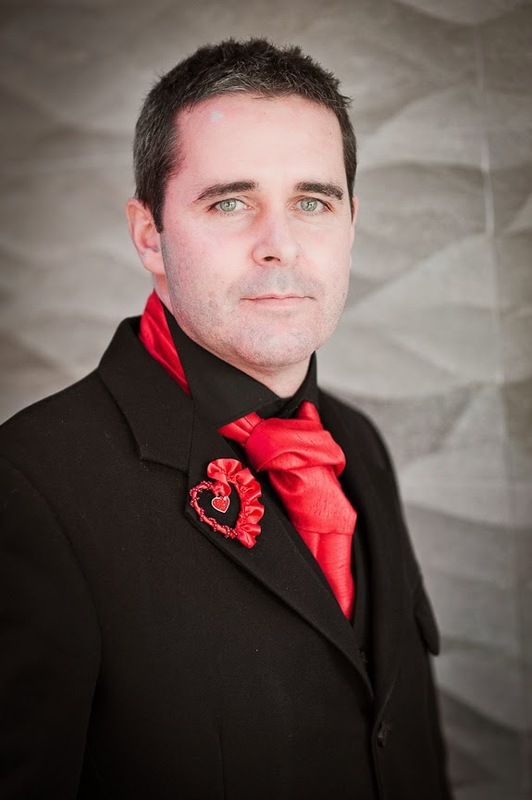 Melissa had decided on a colour scheme of white, black and red and wanted to include the British Heart Foundation pins that they gave to each guest within the bouquets and buttonholes. 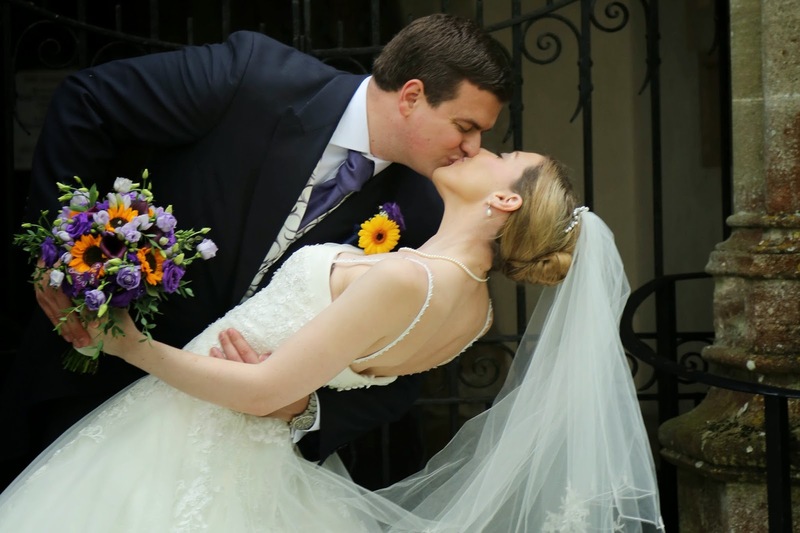 Melissa's dress was stunning and the ruffled shoulder provided the inspiration for the style of her heart shaped bridal bouquet. I continued the line of the ruffle down one side of the heart using scarlet double-faced satin ribbon and chiffon with British Heart Foundation pins nestled into the ruffles. 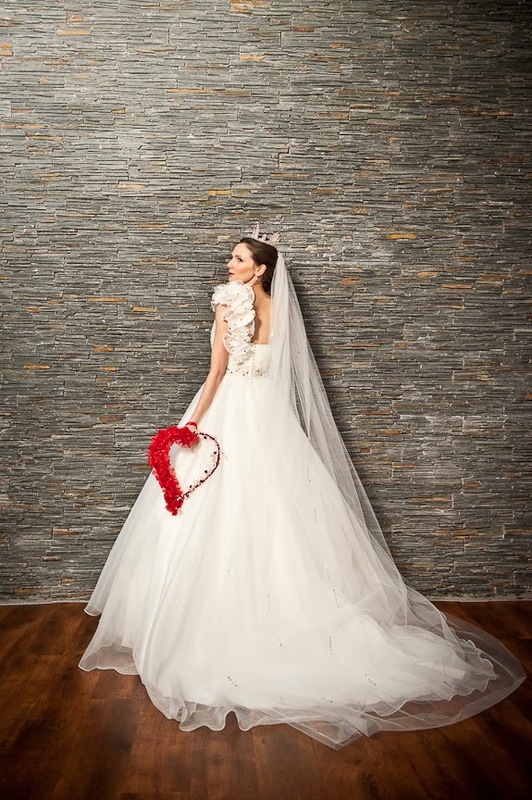 The other side of the heart was made using a vine of cultured pearls, Swarovski crystals and red crystal hearts to echo the detail of Melissa's dress and accessories. 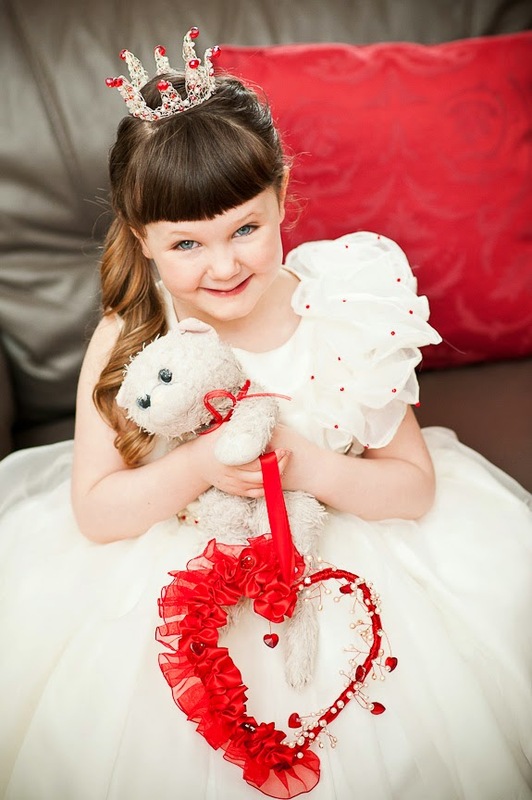 Melissa asked for a mini version of her bouquet for their daughter who looked precious in a matching dress. I designed this as a pomander to make it easier for little hands to hold. 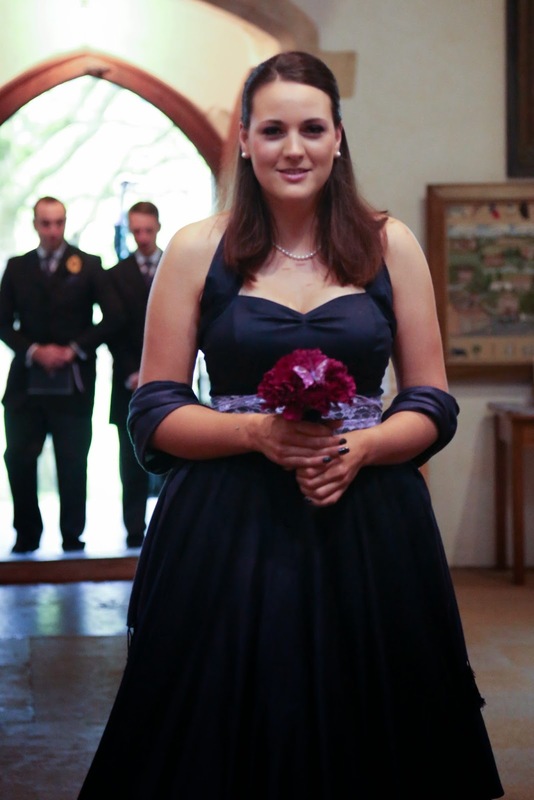 The other bridesmaids wore striking black and red dresses. 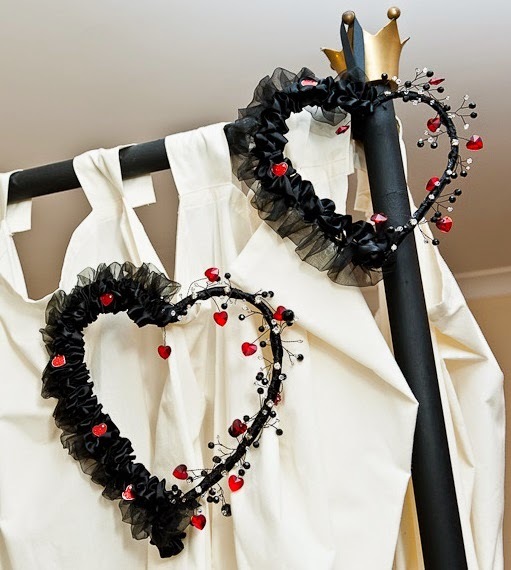 Their bouquets were made using black ribbons in the same style as the Bridal bouquet. Black jet beads were used instead of pearls. 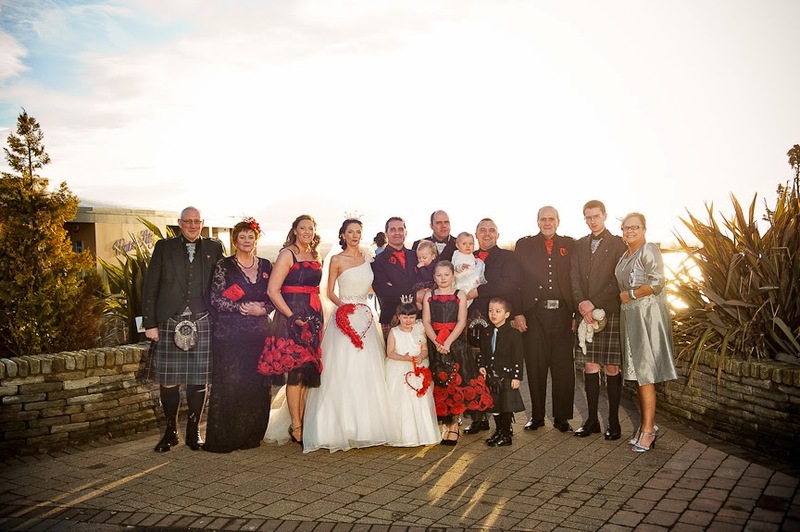 The wedding party looked stunning and perfect for a Valentine's Day ceremony. 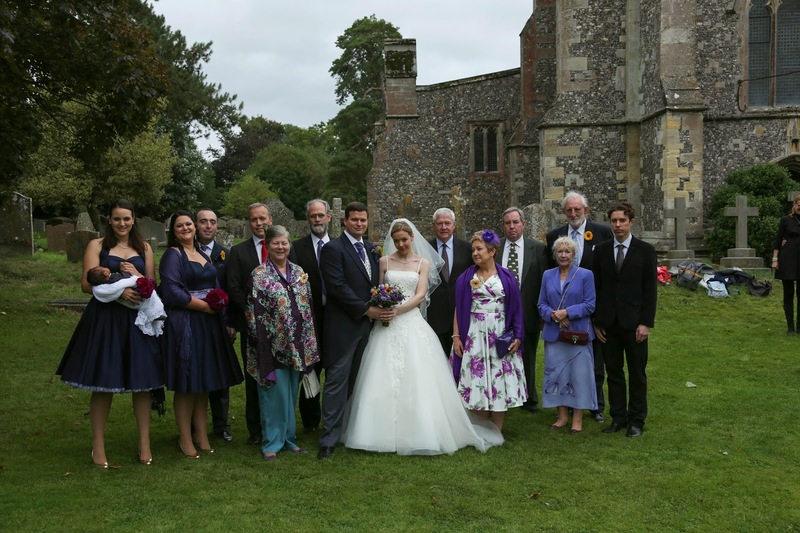 The buttonholes also used the British Heart Foundations pins at the centre with an outer ribbon heart to echo the style of the bouquets. 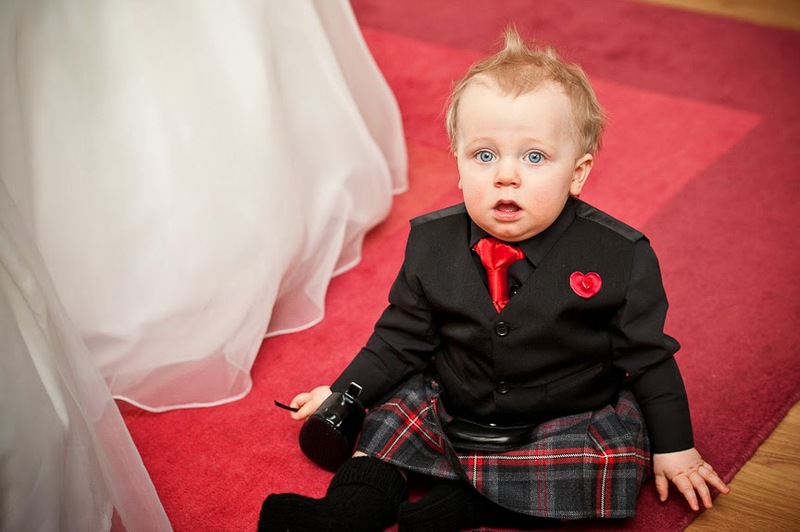 A child-safe version was worn by Melissa and David's handsome son. 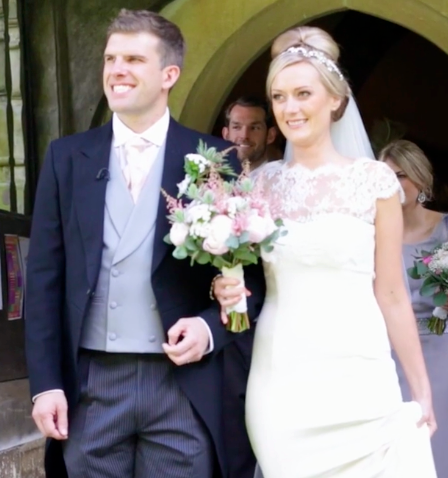 It was a joy to design and make something so individual and unusual for this striking wedding. 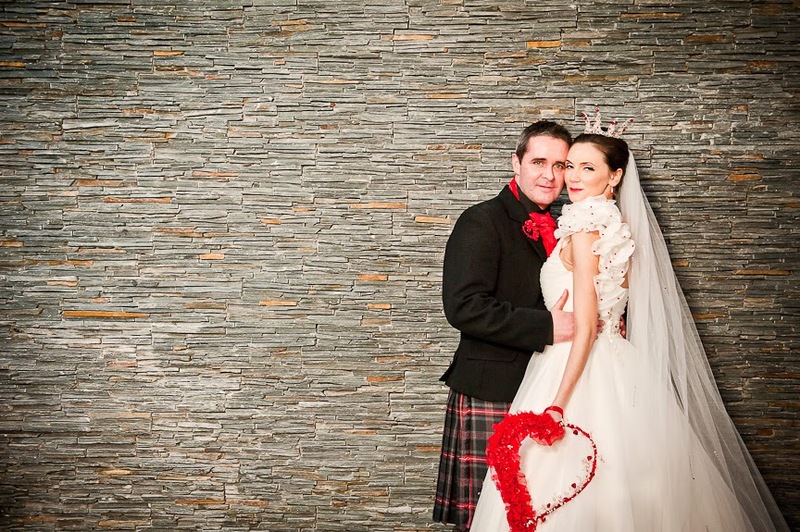 These stunning photographs were taken by the very talented BK Photography. 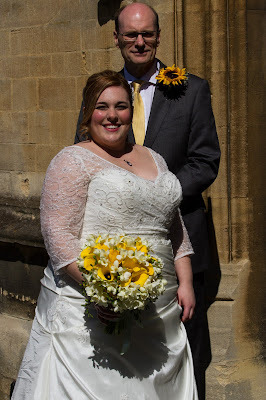 I was thrilled to be asked to help with my brothers wedding to the fabulous Anna. Anna loves Sunflowers and and wanted a mix of purple flowers to contrast with them so I used a mix of Alstoemeria, Lisianthus, Freesia, Campanula, Aconitum and Calla Lillies to create this beautiful and heavingly scented bouquet. 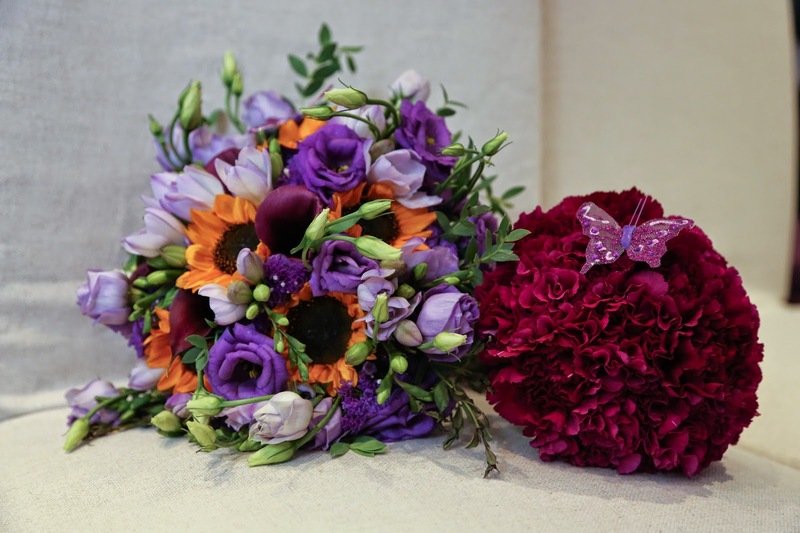 The bridesmaids bouquets were a simple posy of striking Carnations in a deep plum with a purple butterfly as an accent. 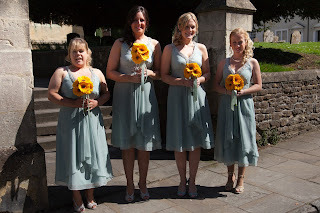 The posies looked stunning as part of the rockabilly style bridesmaid outfits. 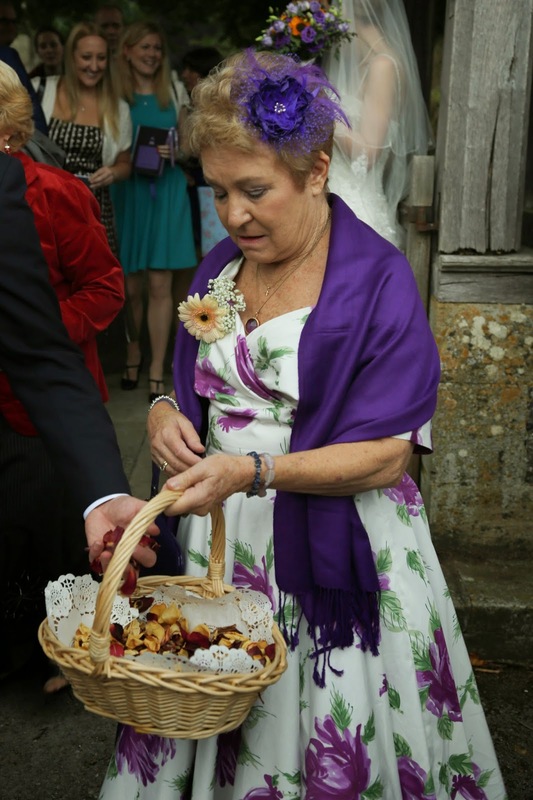 The mother of the bride and groom corsages were delicately coloured Germini and Gypsohila. I also made fascinators for both mothers to compliment their outfits. 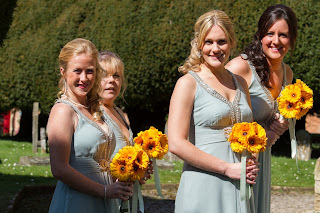 The buttonholes were bright Germini to complement the Sunflowers in Anna's bouquet together with Campanula. 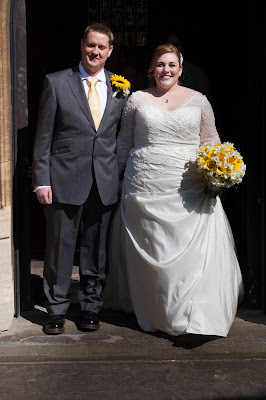 The Groom also had a video camera in his buttonhole to provide an alternative view of the day! 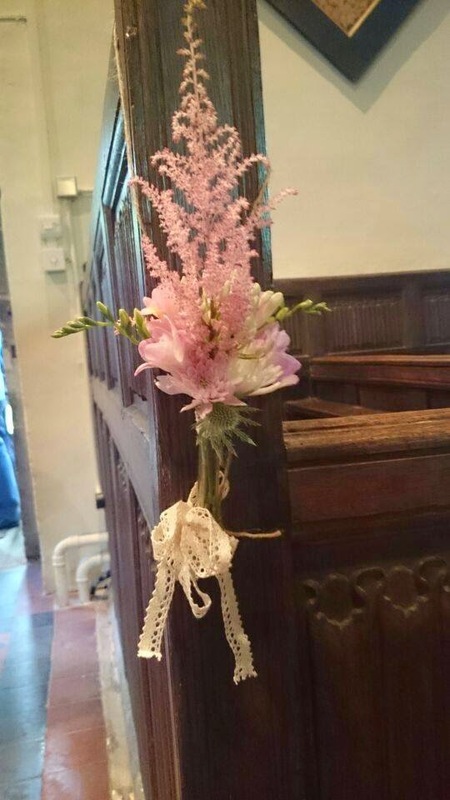 The pew ends were a light and a bright Germini, Lisianthus, Fressia and Bear Grass. 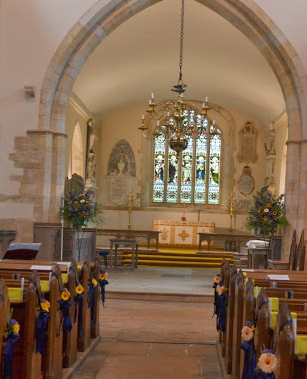 The two pedestal arrangements at the front of the church included statement Sunflowers, Germini, Stocks, Limonium, Calla Lillies, Alstroemeria, Lisianthus, Freesia, Campanula, Aconitum, Eucalyptus, Ruscus, Phoenix Roebelenii Palm, China and Bear Grasses. 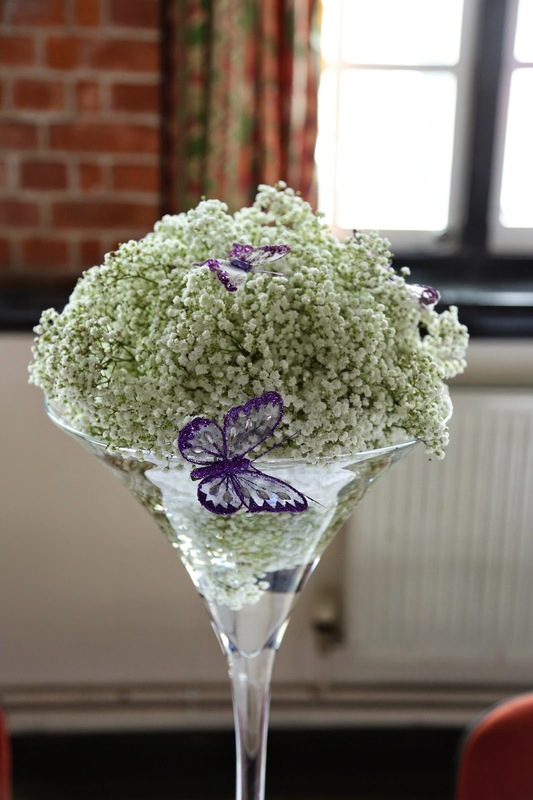 The centrepieces were internally lit floating balls of gypsophila in tall martini vases complete with purple butterflies. 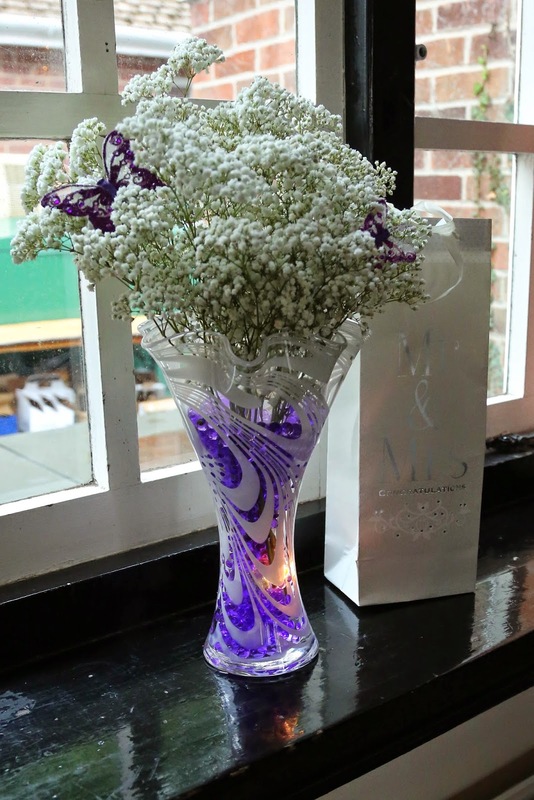 Hankerchief vases of Gypsophila with purple deco balls decorated the windowsills. 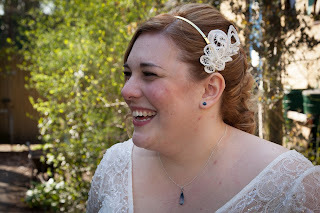 I also made Anna a simple tiara using freshwater pearls and Swarovski crystals. 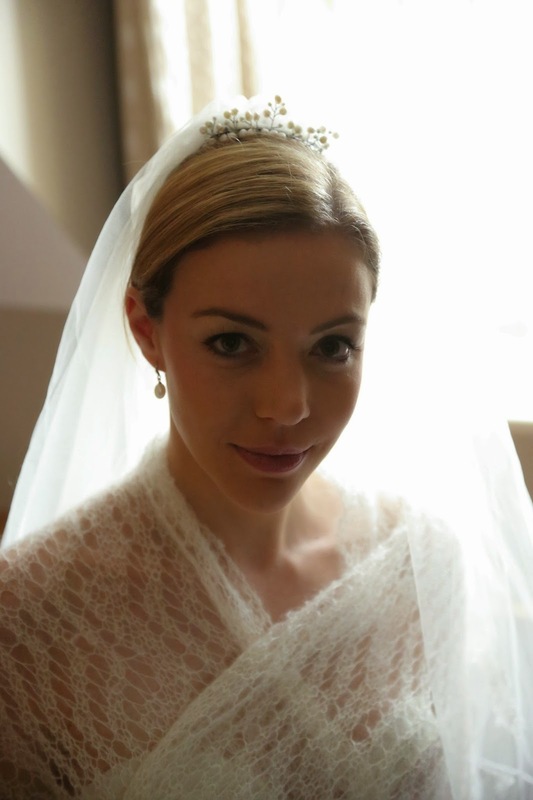 She was a very beautiful bride. 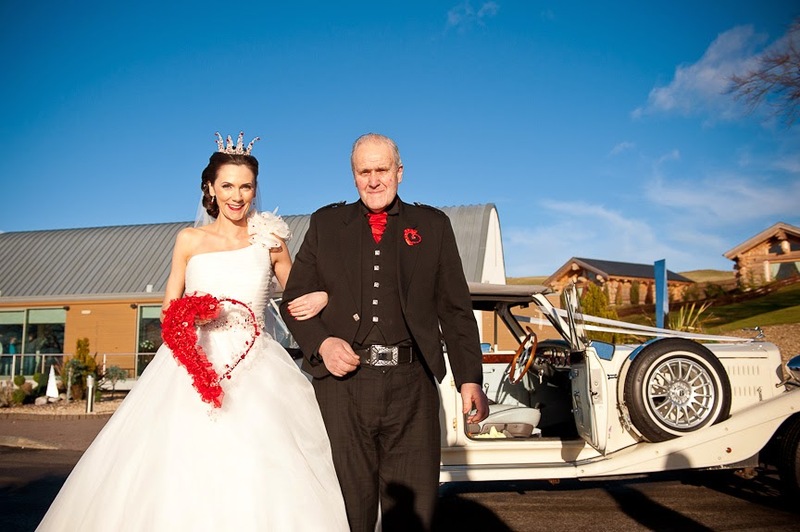 It was a wonderful wedding and I loved helping to make Johan and Anna's dream day a reality. 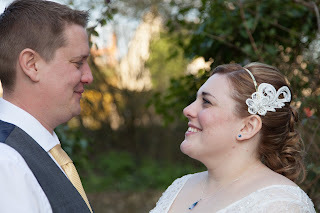 These beautiful pictures were taken by the very talented Rebecca Waters Photography. 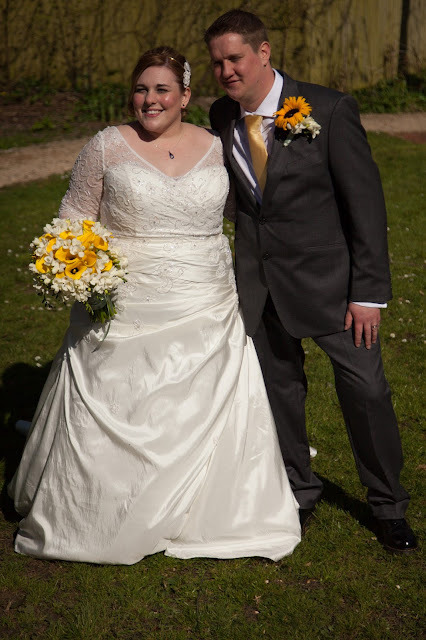 Joanna wanted a vibrant mix of yellow and white for her wedding flowers. 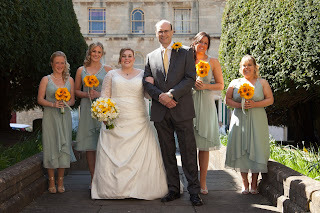 Sunflowers are a particular favorite of both the bride and groom and made cheerful buttonholes. 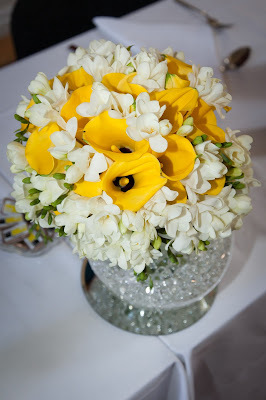 The bridal bouquet was a fragrant mix of freesias and calla lilies. 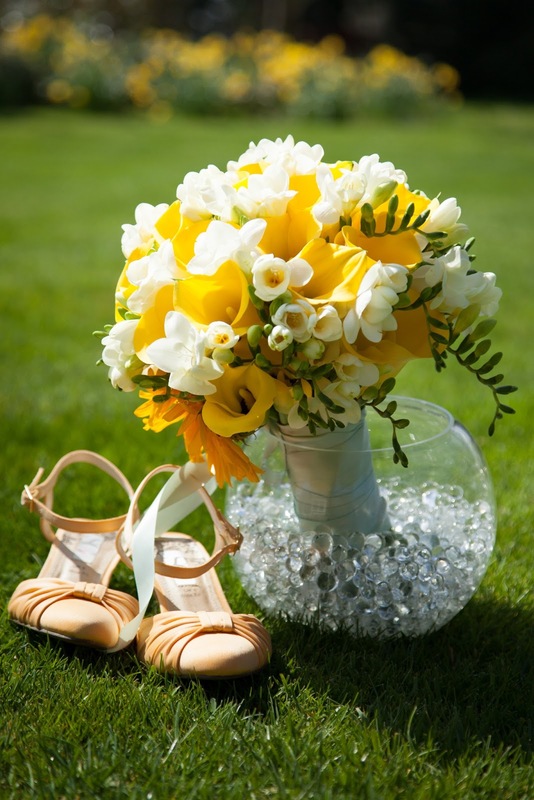 The lively yellow and white colour combination look stunning on such a lovely sunny day. 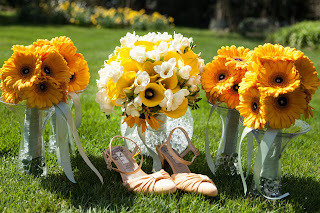 The bridesmaids had simple hand-tied posies of gerbera daisies in vivid yellow. 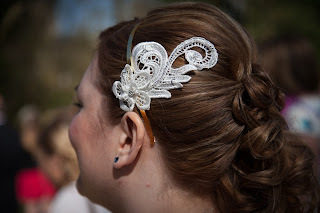 Joanna's lace decorative hairpiece was designed to complement the lace in her stunning wedding dress. Embellished with crystal beading it looked striking against her beautiful hair. 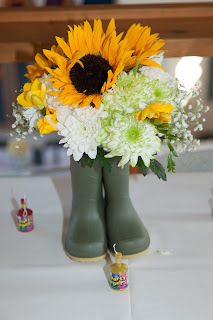 The centrepieces were a tribute to the time that the newly weds spend on their allotment together and looked wonderfully whimsical. 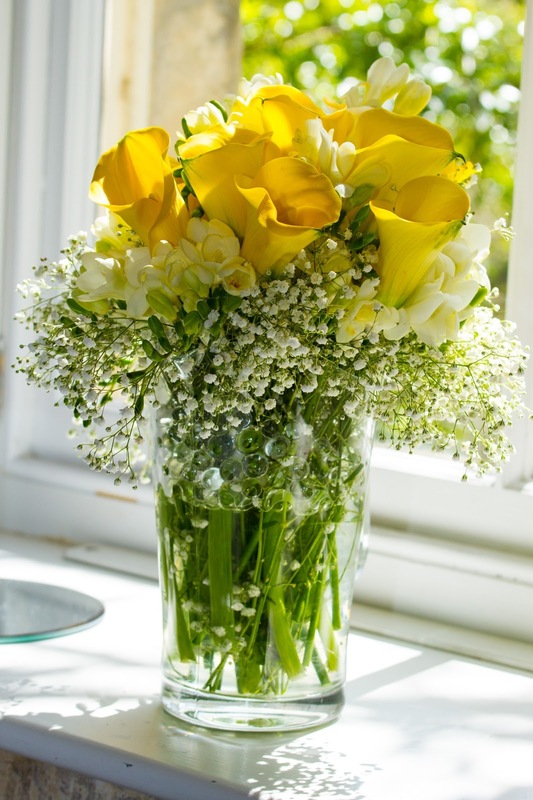 The mix of freesias, sunflowers, chrysanthemums and gypsophila. 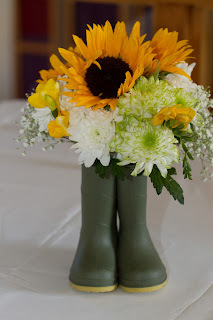 I am keen crafter that has always enjoyed trying new crafts. 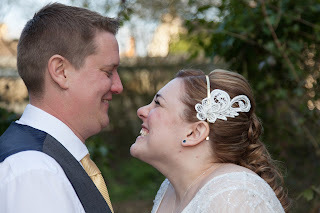 I made the invitations, orders of service, bouquets, buttonholes, tiara, earrings and other touches for my own wedding. 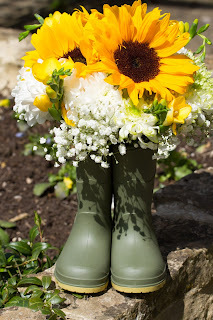 I have since started helping others with the special touches for their weddings and wanted to share these with the world.